I would like to introduce my "older and wiser" brother, Trouble to each of you. Some of you have met him. He goes on some of my therapy visits. He is a 10 year old toy poodle and weighs 10 pounds. He has some back problems. Mom is very particular about where we take him. She says, "He is too fragile to be handled by unpredictable patients." He is much better with elderly patients. He loves to ride in their wheel chairs. Trouble came into our family almost 6 years before I was born. Dad was leaving for work one morning and found him in the culvert pipe at the end of our drive way. It was a cold February morning and Trouble was a "baby" at the time. He only weighed a few pounds. Dad asked our neighbors to take him for the day. He thought someone had lost him and would come for him. After checking with local veterinarians and other places, Dad realized someone had thrown him out. Initially, Dad planned to find him a home. Trouble had found a home, it just took Dad a few days to realize it. He was given his name, because he loved ripping up the bathroom trash. I know, it sounds really yucky, but he did it. When Dad and Mom went to Blacksburg, Virginia to get me, Trouble came along. Trouble was not happy about my arrival in the family in the beginning, but we have become quite close. He lays up against me, especially when he is cold. Trouble is very special. He sleeps with Mom and Dad and basically has the freedom to do as he chooses. Mom says, "he has earned these privileges, because he knows how to obey." He is so smart, he soared through his obedience classes and has a PHD in Dog Therapy and Obedience from Dog Lovers Obedience School, Richmond, Virginia. Trouble would never brag about himself, so I must do it for him. It is difficult for me to wrap my furry paws around the thought of one human year/7 doggie years of blogging. God gave mom the name for my blog (All Gods Creatures) and the ability to give me a voice in the human world one year ago, November 26, 2008. Since my blogging adventure began, I have made many new friends around the world. I am thankful for the love and support each of you have given me. Your prayers and encouragement are a tremendous blessing to my parents, Nanuq, and I. What a tremendous blessing to have my Blog Anniversary fall on Thanksgiving Day. I could not have planned it more perfectly. I am truly thankful! May GOD bless each of you on this beautiful Thanksgiving Day! Today, I am a guest blogger at The Blest Atheist. Ms. Beth is traveling and asked if I would tell her followers a little about dog therapy. I hope you will join me in greeting her followers with furry hugs and love. Last night Mom and Dad served a beautiful dinner to our guests. Normally, we are allowed to lay by the table while our parents eat. However, on this evening they decided to eat on the large table in the Florida room and Mom shut the big glass doors leading from our family room and kitchen. 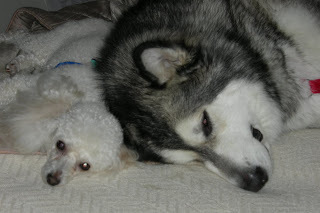 My furry brothers (Nanuq and Trouble), Sister (Macy), and I were left on the other side. I was appalled. How dare they exclude us from their festive event. I am normally very obedient, but my feelings were bruised and battered. After a little while, I decided to express my disgust with the situation. I am tall and getting into trouble is not a problem. I strolled into the kitchen and looked around. First, I eyed a package of yummy wheat hot dog buns laying close to the edge. I quietly opened and ate them "all," but the best was yet to come. AHA, there it was, our guests brought a red velvet cake. I pulled it off the counter, but Mom and Ms. Sue Ellen heard it hit the floor. By the time Mom got to me I had consumed 1/4 of the cake. Mom put me in a down by the big table where they were eating. She thought she was punishing me, but I won. I was right where I wanted to be all along. You see, like a little child who desperately wants its parent's attention, I will get it one way or another. Just so you know, I feel much better since I have confessed to the entire world. I wanted to show you what temptation looks like. This is the doe I wanted to play with. While Mom was trying diligently to keep me under control, Dad was taking pictures of my new friend. Dad is still trying to convince me she did not want to play with me. Dad said, "she has her tail up and that alerts the other deer to danger." I think she had her tail up because she is cuter that way. I think she was flirting and wanting to play with me. If she was afraid, don't you think she would have run with the wind? She pranced around in front of me, while Mom kept telling me to "leave it" and "stay." She stayed close to us for a "long" time. Mom even said, "if she is really scared, she should scamper on away." Dad chuckled. I suppose it was much funnier to Dad since all he had to do was hold the camera. Mom had her hands full with me. At one point, she held me in a down and forbid me from chasing my new friend! I could have broken lose, but Mom would have been devastated if I had run with the wind across the mountain range. She would not have rested until I was back safe. The temptation was almost more than I could bare, but I am glad I was able to control myself. I like the cushy life I have. I am not sure I am ready to go back to the wild. Mom spoils me! Thank you, Mom for keeping me focused. I know I am a handful at times! Mom, Dad, and I experienced many beautiful adventures this past week. We hiked the mountainside and enjoyed watching lots of wildlife. There were a few times when Mom and I found rest amongst the leaves. Mom and I disagreed on one thing. I call it "the chase." There were the cutest deer everywhere. I wanted to play chase with them. Mom said, "NO." Once or twice, I considered bolting, anyway. Clearly, the choice is mine: Obey or disobey! In life we have many choices and some of them are difficult. Deep inside, I know I need to obey Mom and Dad, but the temptation is real and it is difficult at times. I am a big boy and I am very strong. I could chose to go my own way, but it would break my parents heart. What kind of choices are you faced with and whose heart might you break if you disobey?